The new film “The Promise”, directed by Northern Irish filmmaker Terry George, who also wrote In The Name of the Father, Some Mother’s Son and The Boxer, is a very powerful epic drama about the Armenian Genocide which took place in 1915. 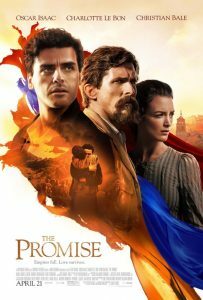 Starring Oscar Isaac and Christian Bale, “The Promise” takes your standard love triangle romance drama and sets it against the background of the Armenian genocide in the crumbling Ottoman Empire, with both fighting for the affections of Charlotte Le Bon and their own lives. You can see a trailer for the film here, and a very informative study guide here. The film is to be released in Irish cinemas on April 28th. Tickets are already on sale. See here for the list of cinemas and the times.